Cine Latino covers, well, all things relating to Latino culture and the movies, every Wednesday. 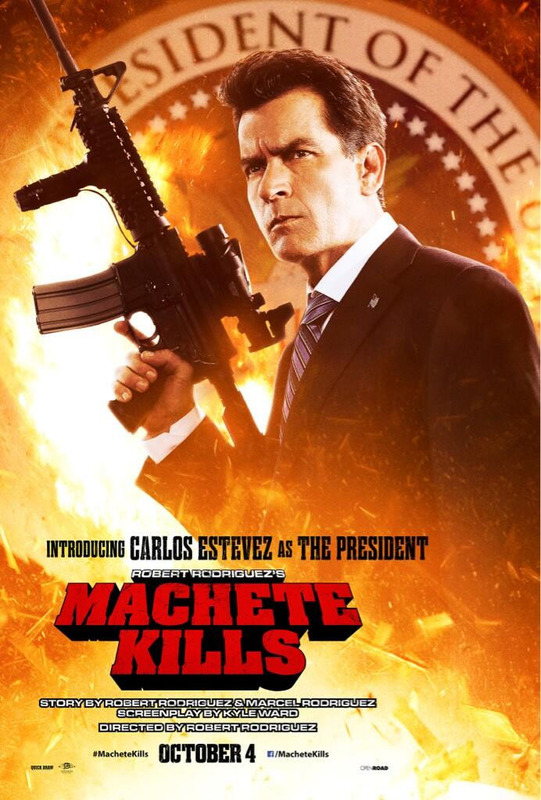 Robert Rodriguez hit the Twitterverse yesterday to release the latest Machete Kills poster, which features Carlos Estevez, aka Charlie Sheen, as the president. Sheen is shown rocking an American flag pin and one massive bad-boy weapon, which leads us to believe that this president isn't afraid to get down and dirty. Danny Trejo returns for more guts and glory in this grindhouse Machete sequel as an ex-Federale who is recruited by Sheen to take down a madman who plans to launch a weapon from space. The star-studded cast includes Demian Bichir, Sofia Vergara, Mel Gibson, Lady Gaga, Alexa Vega, Zoe Saldana, Vanessa Hudgens, Amber Heard and returning cast members Michelle Rodriguez and Jessica Alba. Machete Kills hits theaters October 4. Produced by Telemundo, Premios Tu Mundo will return for a second year to celebrate Latinos in pop culture on August 15, 2013. The awards show combines television, Web, mobile and social media to empower fans to vote in an array of categories. This year, Fandango Cine will be crowning one actor with the Orgullo Latino en Hollywood Award and the best part is that you get to decide. *Click on the image to vote for your favorite Latino Hollywood star.